Did a flash go wrong? Did you wipe /system by accident? Don't have an upgrade path to 4.0.4? Don't worry - with these full images you can forget your trouble and start with a clean slate. Warning: These will wipe your device's user data. 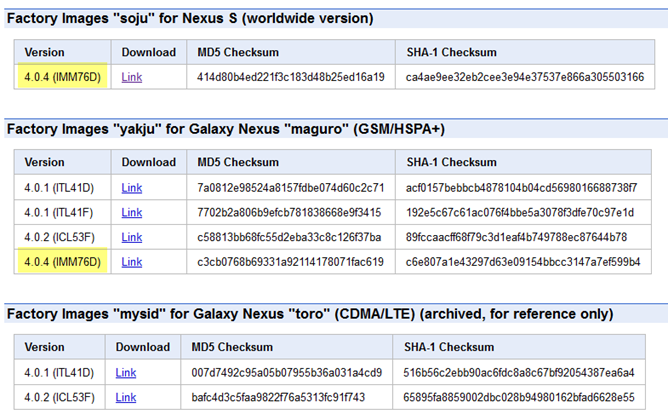 GSM Galaxy Nexus i9250 (yakju only) - if you're not sure whether you have yakju or not, download this app, and it'll tell you. Sorry, Verizon Nexus users (your devices are mysid, not yakju), due to carrier additions you will have to wait a while longer. GSM Nexus S (soju) - according to JBQ, only the i9020T is supported, though there's still a chance i9023 might be (but may not be due to different radios, as the full image flashes those too). It's puzzling to me that even the chief build/release engineer has no compatibility information, but it looks like he's only in charge of keeping track of devices directly supported by AOSP. Note: i9020A is going to be supported in the future with a sojua release. Read this thread if you want to follow the saga. 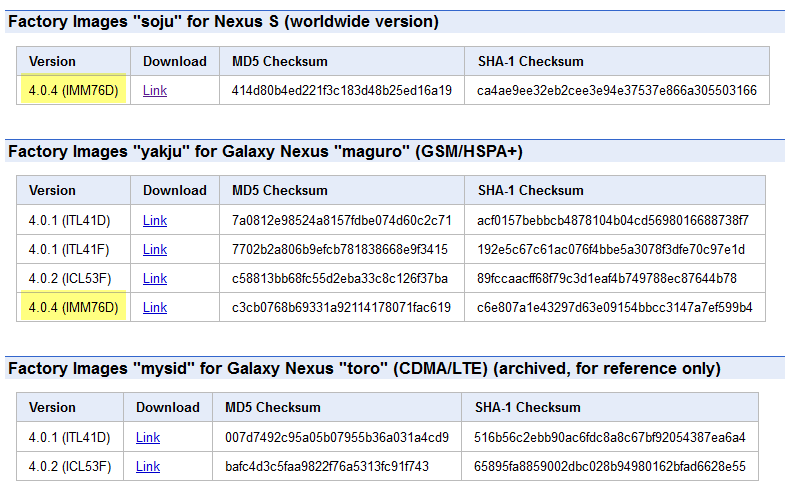 Note: Nexus S 4G users, this is definitely not for you yet. crespo4g (sojus) image is in the works, according to JBQ. The soju image release is actually quite momentous - it's the first time a factory image has been published for any Nexus S model, and that is excellent news. Head over to this page and download away. Make sure the checksum matches before flashing. This AndroidToBe post has many more details, I recommend visiting it if you need further directions.